Stay as "Cool as a Corpse" with Cookies and Scream Tombstone Popsicles! Stay as “Cool as a Corpse” with Cookies and Scream Tombstone Popsicles! Beat the summer heat with these super easy Cookies & Scream Pudding Pops decorated to look like little tombstones! Personalize each one with a name, or just a standard "RIP" for a creepy way to cool off. 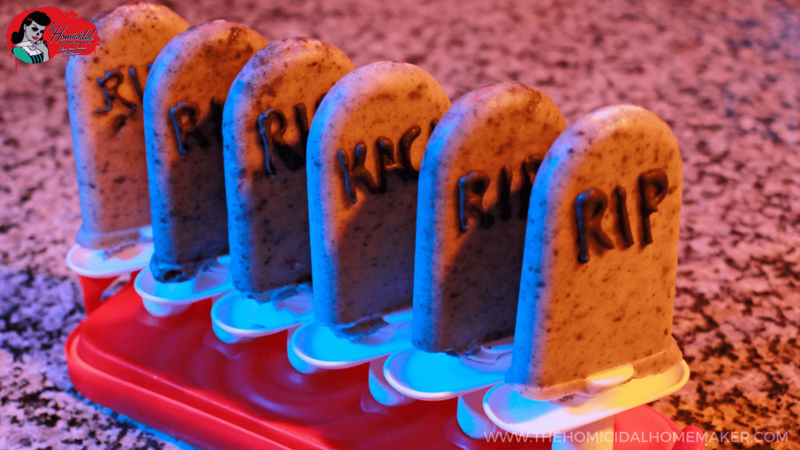 Cookies and Scream Tombstone Popsicles – A Creepy Way to Cool Off! You’ve probably guessed that October is my favorite month…well, fall in general is my favorite. I love the crisp, cool weather, and I am NOT a fan of the summer months, so I’m always looking for a way to cool off during the dreadfully hot summertime. Watch this video to learn how to make some bone-chilling Cookies and Scream Tombstone Pudding Popsicles that are a snap to put together! I used a Zoku Quick Pop maker that I purchased to quickly flash-freeze my Cookies and Scream Tombstone Popsicles, but standard popsicle molds with a rounded top will work just fine! 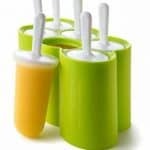 Zoku makes these easy-to-use Classic Pop Molds. First, crush your cookies up into small crumbs. You can either do this with a food processor, rolling pin, or with a fork. In a separate bowl, mix together the instant pudding mix and milk, following the directions on the box. Once combined, add your cookie crumbs to the pudding, and mix together. For molding the Cookies and Scream Tombstone Popsicles, I used a Zoku QuickPop Maker, which flash-freezes your popsicles in about 7 minutes, but standard popsicle molds with a rounded top will work just fine. Pour the pudding mixture into the molds, and allow to freeze. For decorating the Cookies and Scream Tombstone Popsicles, you have two options – you can either pipe the melted chocolate directly onto the popsicle, or, you can pipe the words out onto wax paper, allow to harden, and then attach to the pops with a little bit of melted chocolate. A pastry bag, or ziplock bag with the corner cut off will work just fine, but I used a nifty silicone pen that I found at the craft store. Get creative with it! You can personalize them for each guest, put silly names, or just go with the standard “RIP”.